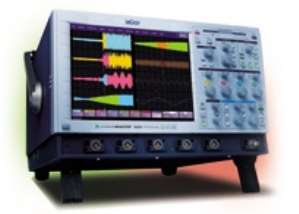 Extra Specifications: Digital Oscilloscope ,3GHz, 4 ch. The LeCroy WaveMaster 8000A Series oscilloscope offers a unique combination of high bandwidth, fast sampling speeds, and long memory capture, ideal for digital and communications systems. Equipped with our patented X-Stream technology, its fast data transfer and processing system deliver unprecedented measurement capabilities, at speeds 10-100 times faster than conventional oscilloscopes. Providing true WaveShape Analysis, its high-performance capabilities are changing the way engineers think about design and testing.